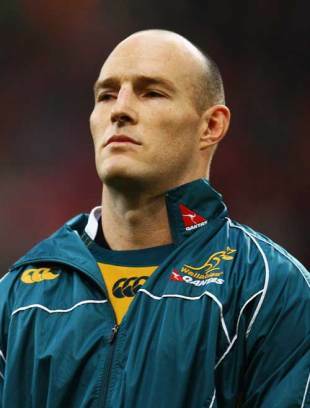 Stirling Mortlock returns as captain while two new caps have been included in the Wallabies squad for this season's internationals. The country's third most capped skipper with 25 Tests in charge, will lead Australia for a fourth season, in a squad that sees first-time call-ups for the Western Force pair of Matt Hodgson and Pekahou (Pek) Cowan. "Both Matt and Pek have been included with one eye on the future," said Wallabies coach Robbie Deans. "They both play in areas where we have a clear need, and are looking to build up our depth. Their selection today gives us an opportunity over the next month to get them started, in terms of exposing them to the international environment." The 18-year-old Force fullback James O'Connor has been called-up from the Australian Under-20s, for whom he was named earlier in the month, into the Wallabies maintaining the youthful flavour to Deans' squad. A number of players do miss out through injury with No 8 Wycliff Palu out with a broken hand, he is expected to return in time to be considered for the Tri-Nations, but other long-term absentees include utility forward Hugh McMeniman, wing Digby Ioane and lock Mark Chisholm. Phil Waugh has been included in the Wallabies' squad, but is being released to appear for the Barbarians in their upcoming matches against England and Australia in Sydney.